In yet another attempt of the BJP government to gag the voice of dissent, the Tripura police have slapped sedition charges against a group of people for allegedly raising ‘anti-national’ slogans during a protest rally taken out against the controversial Citizenship (Amendment) Bill. Biplab Deb-led BJP government on Tuesday ordered the police to file FIR with sedition charges against two tribal leaders and one tribal human rights activist for participating in the rally against the Bill at Khumulwng, the headquarters of the Tripura Autonomous District Council on January 30, NDTV reported. INPT general secretary Jagadish Debbarma, IPFT (Tipraha) leader Aghore Debbarma and activist Anthony Debbabrma of the Borok People Human Rights Organization have been named in the FIR. The organisers of the rally, however, said the allegation was baseless. “We have taken a case against those leaders and people who participated in the rally. Anti-national slogans were raised,” the channel quoted a police official as saying. The case was registered based on video evidence in which the leaders were seen raising the “anti-Indian slogans”, they said. 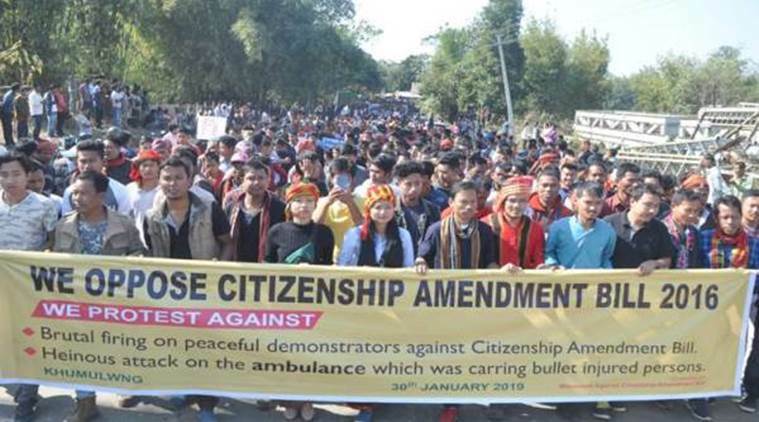 The rally, organised by the Tripura United Indigenous Peoples Council (TUIPC), a joint body of 48 returnee groups led by the former All Tripura Tiger Force (ATTF), was led by Tripura Congress working president Prayot Manikya Debburman. The Assam Police on January 10 registered a sedition case against KMSS chief Akhil Gogoi, scholar Hiren Gohain and former journalist Manjit Mahanta for allegedly speaking “against the law” at a protest meet in Guwahati against the Bill.